"A modern young lady may find it more convenient to work on this antique lap frame...The charming Sunbonnet Girl quilt is in the process of being made as a keepsake with all the fabrics from one girl's wardrobe from age one to twenty-one." 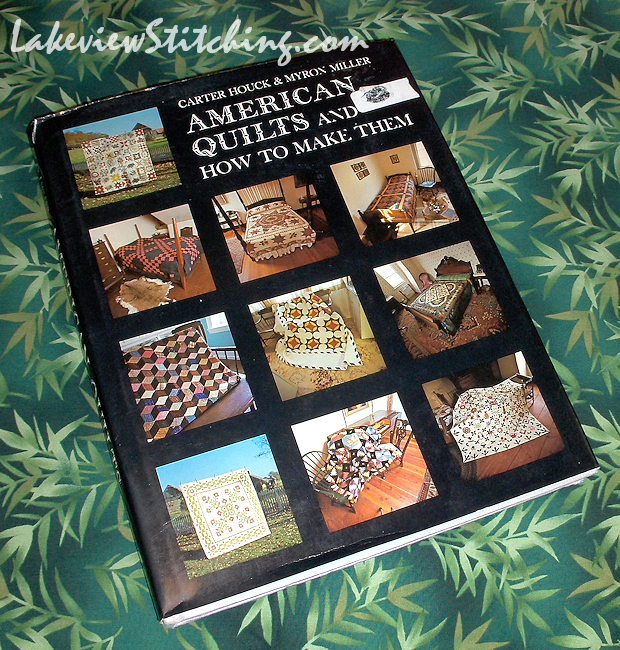 Last weekend I was browsing through a used book store when I came across this amazing treasure, American Quilts and How to Make Them, by Carter Houck and Myron Miller (Charles Scribner's Sons, 1975). I have not been in a used book store in years, but I thought it might be fun to check it out. Apparently, I was lucky to find a quilt book at all, because they sell quickly, I'm told. In any case, this one is both amusing and useful at the same time! 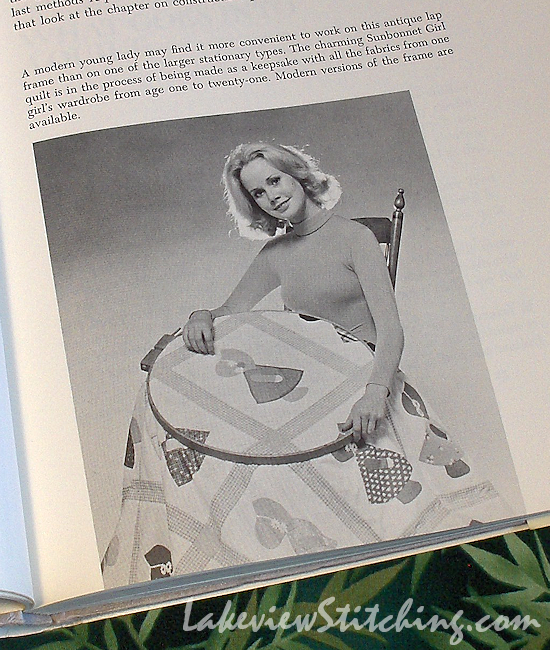 In the amusing category, on page 17 there is a chapter titled "Equipment for Successful Quilting:"
"Fortunately, no one has been able to invent a lot of expensive electric equipment for quilting. There aren't even many tempting but useless gadgets on the market to lure the quilter and make her spend money. 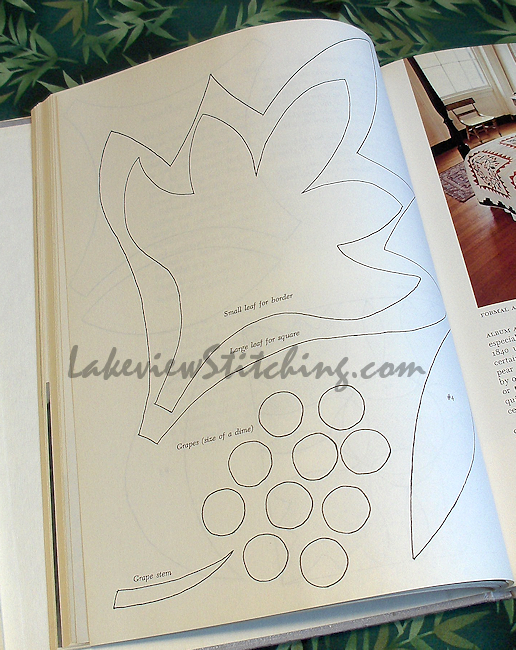 The largest item on her list is a quilting frame and that can be built at home quite simply." 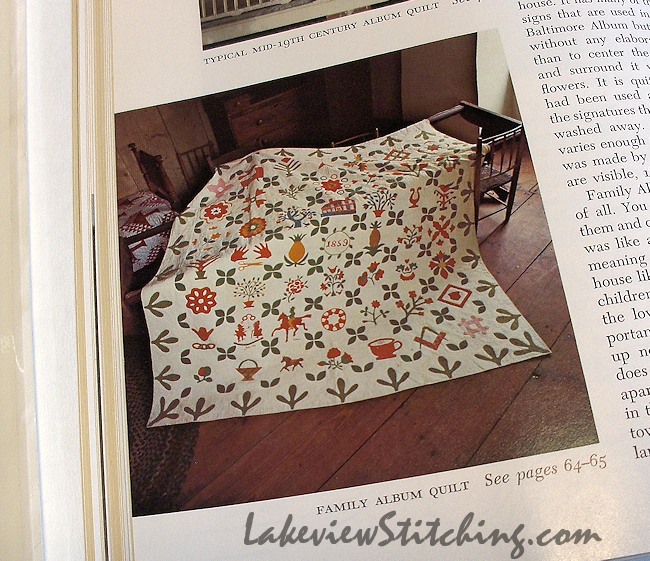 But, in the useful category, there are photos of lots of great historic quilts, and simple patterns for many of them. 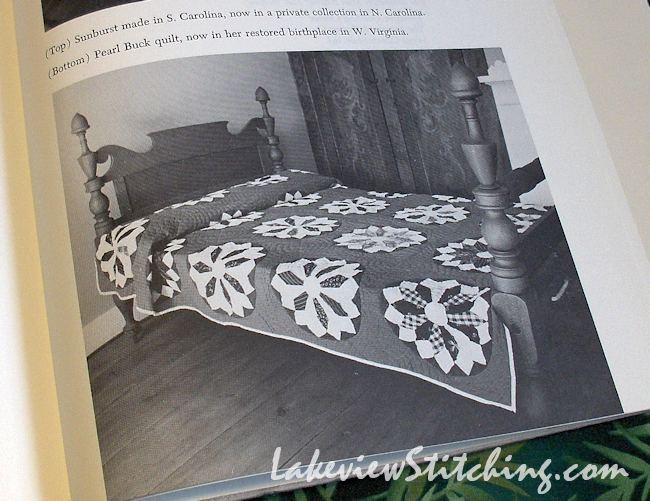 I think the authors chose the quilts for the book with a very modern eye, because many of them have large, simple and graphic designs. Would you guess that the above quilt, Robbing Peter to pay Paul, is pre-Civil War? You could easily find a similar design at Crate & Barrel or Pottery Barn today. The blocks are here called "Indian Trails," which to me suggests a good colour scheme as well. I'd love to make it some day! 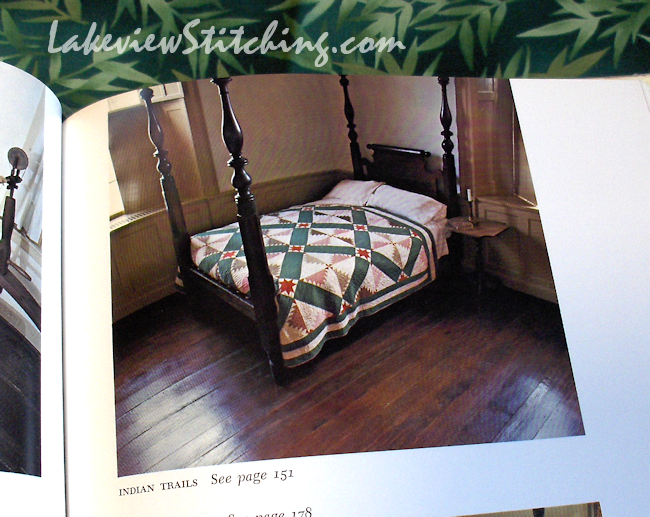 The quilt is from Illinois in the early to mid 1800s, and the authors suggest that the threads have been saved and reused, as well as the fabrics! Apparently the background is red! Pearl Buck's parents were missionaries to China, which may explain the inspiration for the colour. I love how it has elements of both a sunburst and a Dresden plate, as well as the large, graphic design. And plaids too! So, that's another one for my to-do list. What do I like about this? The cat, of course! 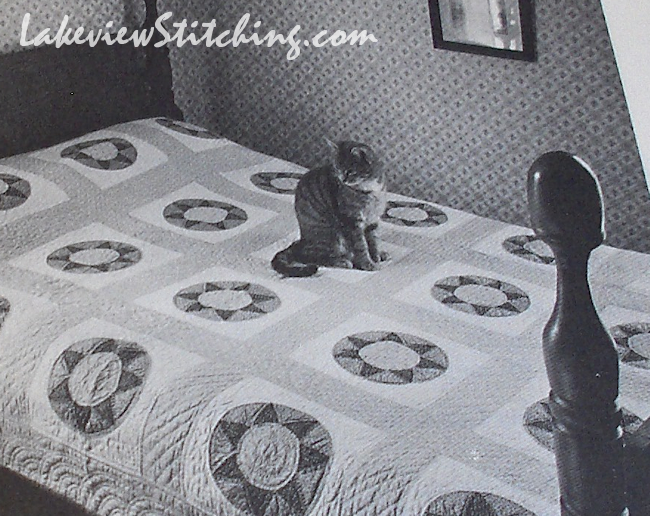 I think cats have been staking out quilts as long as there have been quilts and cats! Looks like a great book! 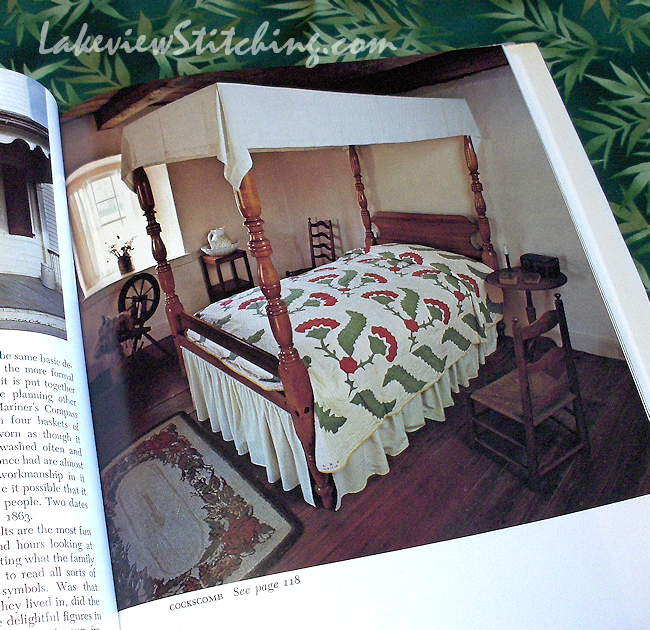 Reminds me of my copy of Better Homes and Garden America's Heritage Quilts is also a great book, got my used copy on Amazon for next to nothing. had to visit amazon and yes I have got the book for 1p with postage £2.89 CAN`T GRUMBLE AT THAT CAN I?? Well you know, I remember 1975 well, but I also feel like it was a dramatically different life than ours today. To me, that is part of the contrast in the book, to see what feels familiar, and what doesn't. It is interesting to see where we draw the line between dated and historic, because the older quilts feel more current than the new one! There really isn't anything new, is there? Thanks for sharing this. I missed it when first posted. 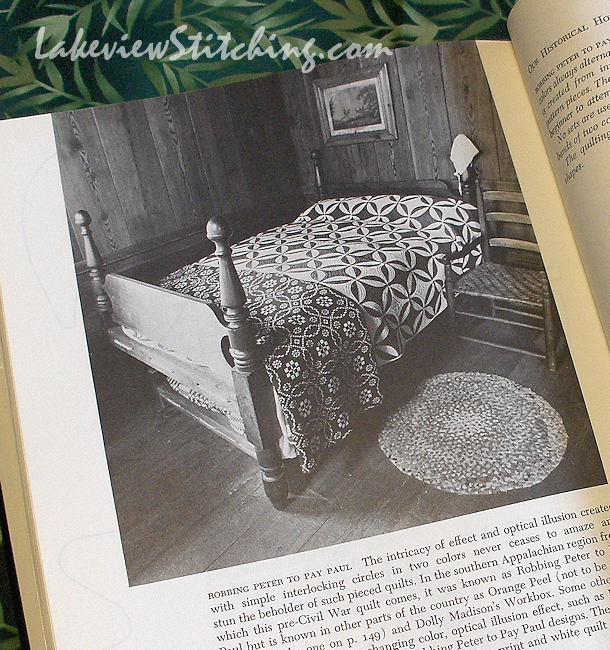 I love the threads of continuity and the stories the quilts enable us to tell. Yes, exactly, Jillian. Me too! Its amazing how times have changed. Decor and sewing aids included. Mind you some of those older books do have some wonderful patterns that can look very up to date in modern fabrics. In fact even the fabrics have changed in quality etc some good and some terrible!